2019 Physician Packet Now Available – click here. Welcome to the website of one of the most innovative programs in the United States. Designed to assure access to obstetrical services for all Commonwealth residents, the Virginia Birth-Related Neurological Injury Compensation Program also has distinguished itself by assuring superior care for admitted children. 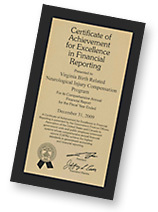 The Birth-Injury Program is a recipient of the Certificate in Excellence in Financial Reporting. This honor is awarded by Government Finance Officers Association of the United States and Canada. Disclaimer: All information on this website is intended for general informational purposes only and should not be considered legally binding, legal advice, nor substitute for obtaining legal advice from competent legal counsel. Although reasonable efforts are made to keep information on this site accurate, no guarantee is made as to its accuracy.